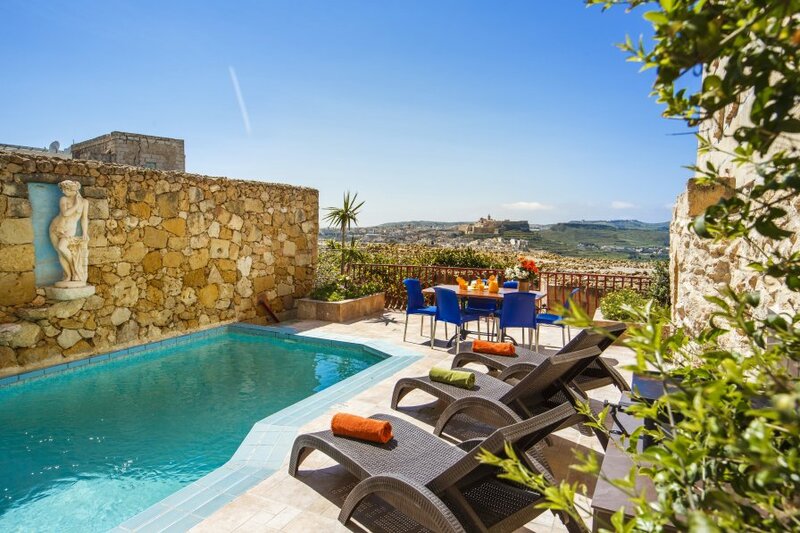 Ta' Vitor Farmhouse makes part of the Bellavista Farmhouses Gozo collection - a group of 20 farmhouses all located next to each other in the tranquil areas of Xaghra village, and enjoying the most spectacular views on the island. One enters Ta' Vitor Farmhouse to find a tastefully furnished sitting & dining area and overlooking the private pool outside. The kitchen connects with the pool terrace and is fully equipped. The pool terrace outside is equipped with a BBQ (that has a heated plate upon which the food is placed and operates by gas), garden furniture (tables and chairs), sun loungers and umbrella. The views of the citadel and the countryside are truly remarkable, especially during sunset when the villages are all lit up. All the 3 bedrooms have ensuite bathrooms. One of the twin bedrooms in on the first-floor level, and the other two bedrooms are located on the second-floor level, all accessed via rustic stairs. There is air-conditioning units in all rooms. To use the A/C you need to purchase a prepaid card of 5 Euros from our reception. One card lasts about 9 to 10 hours if used moderately. You can see the consumption on the display screen in the farmhouse. The BBQ has a heated plate ontop of which the food is placed.